5-minute GAPDH immunodetection for Western blotting and protein normalization from Advanced ImmunoChemical. 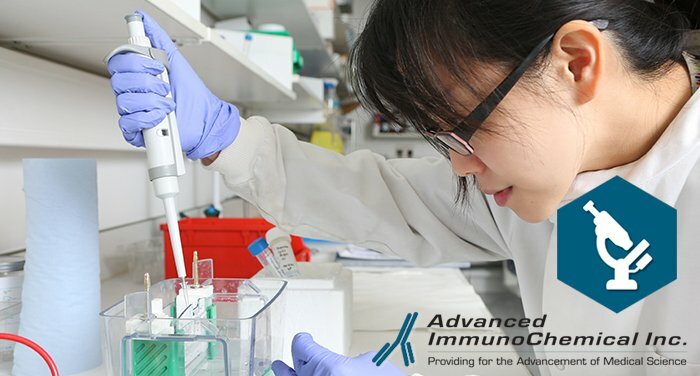 - Advanced ImmunoChemical Inc.Advanced ImmunoChemical Inc.
Home » Article » 5-minute GAPDH immunodetection for Western blotting and protein normalization from Advanced ImmunoChemical. 5-minute GAPDH immunodetection for Western blotting and protein normalization from Advanced ImmunoChemical. Here we announce a direct MAb 6C5-HRP conjugate in place of secondary antibodies plus a GAPDH loading control for Western blots and protein normalization available online. Click here: GAPDH Western blot Set. GAPDH (Glyceraldehyde-3-phosphate dehydrogenase) is one of the key enzymes involved in glycolysis, catalyzing the reversible oxidative phosphorylation of glyceraldehyde-3-phosphate. Besides functioning as a glycolytic enzyme in the cytoplasm, recent evidence suggest that mammalian GAPDH is also involved in a great number of intracellular processes such as membrane fusion, microtubule bundling, phosphotransferase activity, nuclear RNA export, and DNA replication and repair. Click here: GAPDH AssayNotes and protocol. The GAPDH molecule is a homotetramer composed of four 36 kDa subunits. Since it is constitutively and stably expressed in almost all tissues at a high level, GAPDH has become a well-established “housekeeping” protein and is widely used as a loading control for protein normalization in such procedures as Western blotting. It is also useful for cell visualizing in microscopy assays. Some physiological factors, such as hypoxia and diabetes, can increase GAPDH expression in certain cell types. Our Anti-GAPDH monoclonal antibodies are well characterized with MAb 6C5 suitable for GAPDH immunodetection in Western blotting, sandwich immunoassay and immunocytochemical applications. Remarks: GAPDH Western blot 5-minute set contains monoclonal mouse anti-GAPDH, MAb 6C5, horseradish-peroxidase conjugated plus human GAPDH antigen as internal standard/calibator.